I absolutely LOVE black licorice!! Of course, I am using a dose of hyperbole to get my point across; but, nevertheless, I am often met with disgust and confusion when I mention this particular candy preference to those I encounter. My family has always painted me a freak for hoarding black licorice jelly beans at Easter time, my friends give me the awkward side eye when I purchase bags of "that old lady candy" at the movie theater, and even shots of Jagermeister at the bar elicit nothing but groans from fellow patrons. What is it about the slate-colored confection that creates such hostility? Andrew from Sports Card Info - one of our hobby's premier online voices - partnered with rookie candy-maker, Long Ball Licorice, to offer a free sample of their product to one lucky re-tweeter. With my great affection for the dried root of the licorice plant, I couldn't help but click those rotating arrows. Lo and behold, I just so happened to win the drawing - I was as giddy as a school girl! Long Ball Licorice is a new product that was launched late last summer. Andre Chiavelli worked for many years at Yankee Stadium as an official vendor of memorabilia and baseball cards at the ballpark. As the years went by, he couldn't help but notice the ubiquity and importance of concessions at the stadium. Furthermore, as bans and local ordinances against chewing tobacco worked their way up from the local ballparks and into the MLB limelight, he saw an opportunity to pursue an idea which had been kicking around in the back of his head for a long time: plug-style licorice. As you can see from the business card that came along with my freebie, Chiavelli was able to secure the likeness of Babe Ruth as a sort of mascot for his new passion project. It was during his tenure at the second iteration of "the house that Ruth built" that Andre made the acquaintance of and formed a lasting friendship with Linda Ruth Tosetti, the granddaughter of "Sultan of Swat." Through this connection, he was able to secure the official license of the Babe Ruth Estate and the aptly named Long Ball Licorice had it's face - it was a perfect match. Sidenote - this business card will likely be stashed in my oddball baseball card collection. It's simply too cool to be ignored. Here's a look at the bag which contains my prize - it has a lovely, ornate design, evocative of the rough and tumble days of early twentieth century baseball, along with George Herman Ruth's mug. It's a good thing I was able to control myself long enough to take a picture of the package for posterity before I tore open the seal! For the heck of it, you can take a gander at the back of the pouch, as well. Along with a motivational quote from the baby-faced "Colossus of Clout" himself, you have the corresponding web address for Longball Licorice. My favorite part of the whole package though is the fact that the government-mandated nutrition facts are labeled as "box score." I got a nice chuckle out of that detail-oriented joke - it's the little things that make great things! Here's what remains of the 3.5 oz licorice bar, or plug as it is technically called. Over the past handful of days, my lovely wife and I have been ripping hefty chunks out of the pliable brick and plopping them in our mouths. I have been taking a piece and parking it in my cheek, a la smokeless tobacco, allowing the flavor to smoothly melt into my mouth. Meanwhile, my wife has been attacking it head-on, taking a bite and chewing right into it for more immediate gratification. Either method works, as the licorice is both soft and hearty, with a strong and pleasant flavor that leaves you wanting more. Personally, I've had to fight myself from downing the whole thing in one sitting. Andre's creation also features a red raspberry variant, called Round Tripper Red, and red licorice seems to be almost universally loved. I was offered my choice of either for my contest win, but there was little doubt that I was going to opt for the onyx-shaded stuff. So, if you're one of those who scoffs at the notion of black licorice, I'm sure the crimson-colored version is quite tasty, probably even better than Red Vines or Super Ropes. I know it's of high quality. Right now, distribution of the candy appears to be limited to the Longball Licorice website and Amazon. That said, it appears as though the plan is to expand to ballparks across America, in the coming year, so keep your eyes peeled when you hit your local stadium this spring. Candy store distribution is also on the horizon. If you're looking for a substitute for Red Man, or if you just simply enjoy candy, I cannot recommend this product enough. I'll put it this way - Alexander the Great was known for supplying his troops with rations of liquorice root and, thus, I'm sure he would have been all over Long Ball (it's resealable pouch travels well, after all). Here's hoping Mr. Chiavelli's variation takes over the world, Alex-style! 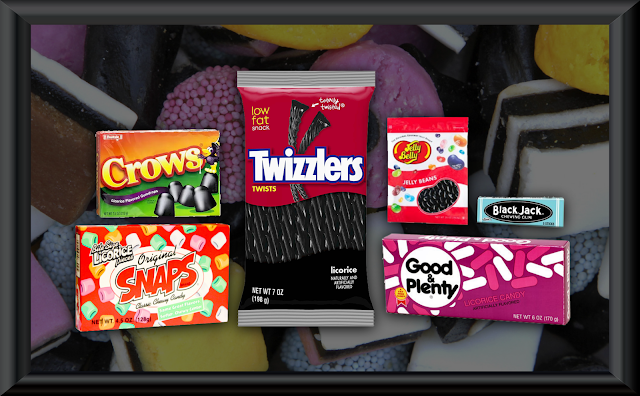 As far as licorice goes, Long Ball is light years ahead of Good and Plenty, Black Jack chewing gum, Twizzlers, allsorts, Crows or any other incarnation of the stuff that you can think of - put that in your licorice pipe and smoke it! To conclude, I have to ask, how do you feel about black licorice? Are you one of those who would turn up their nose should I offer to share my bag of Snaps? Or, does this review have you salivating, uncontrollably, all over your smart phone screen? Please feel free to share your thoughts in the comment section below. And, most importantly, thank you to Andrew, Sports Card Info, Andre Chiavelli and Long Ball Licorice for coming together to offer such a generous giveaway - it made my day, several times over! With all that out of the way, I think I've sad all I can say... so, it's time to cram another piece of Long Ball in my yap. I'm not a fan of black licorice. My sister and mother are so it always seemed to be around the house growing up. I'll have to keep my eye open in ballparks for the red version. Alcoholic shots of black licorice flavored drinks are also not my favorite but you gotta do what you gotta do. Glad you enjoyed Sports Card Info and Long Ball Licorice's contest, and result, and thanks to them for running it. Happy to see someone else likes black licorice. My girlfriend can't stand it, which is awesome because as you mentioned the jelly beans...they're all mine! My sweet tooth usually points toward chocolate (if I'm not mixing my metaphors too much), but in a bag of jelly beans or something I'm happy to take the black licorice. It’s custom made in Australia nothing like what’s made here I learned they Australia is be capitol of the worlds finest licorice it’s amazing ! Yeah, but does it team up with Mr. Pibb? I usually buy the mixed family pack of Red Vines, because I know that all of the black licorice inside will go to me. I can do black licorice in small doses. It's not bad, it's just not something I ever crave. My sister gifted me a box of the Round Tripper Red at Christmas, but I've been saving it for my spring baseball coaching season. I'm really excited about the pouch and how easily it will fit into the back pocket of my baseball coaching pants. I'm sure I'm going to love it! Love me some Twizzlers and Red Vines but I don't think I have the self control or a sophisticated enough palate to properly savor a $6 pouch. First it lasts a long time by design so it’s not apples to apples comparing value like that but We now have our licorice in Dip style 2.99 a jar ! Awesome! Definitely wouldn't have chosen black, but hey, I like how you own it. I love how he got the Ruth likeness for his packaging. Makes it even better! And thanks for the back story. Super cool! We also have Red Raspberry it’s delicous ! Congratulations! Although I prefer red licorice, I'll totally chow down on black licorice too. Believe it or not black sells almost as much as red ! So it’s a must to have in the line up !